The Best Way to Measure Your Progress. 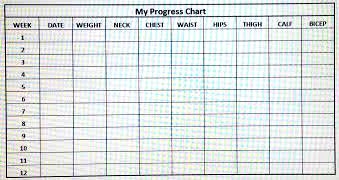 A Progress Chart is a great way to stay motivated is to track your progress! First off; how do you start moving in the right direction so that you can see measurable progress? Here is my recommendation to get you started off on the right foot.If you are combining the Eat Clean To Stay Lean Program with a regular workout program such as my Perfect 10 Body Pump you WILL see changes. As human beings, we tend to be our own worst critiques and sometimes it takes solid proof of change to believe it. I can tell you from personal experience that I was not excited to take my before pictures in a swim suit but I am thrilled that I did it! I can look back now and remind myself how far I have come. I'll teach you how to log your stats & take your progress pictures just as I did when my journey began. As a matter of fact I still log my progress the same way till this day. My journey never stops; it is constantly evolving. So here is what you do. Get a swim suit that you are going to take the photos in. the more skin it shows the better. Don’t be shy! Get in your swim suit and stand in front of a white wall. Make sure the lighting is good and there is not allot of things in the photo to distract or take away from you. You are the main focus. have a friend or loved one take this pictures unless you know how to set up your timer. No bathroom mirror selfies for this. These pictures are forever so make them good. Note: always take your updated photos in the same swim suit. The more consist they are the better. You are not going to flex or pose in these photos. The first one will be you facing forward; looking towards the camera. The next is your profile picture. Simply turn to the right for this shot. Lastly is you’re your back picture. Turn and face the wall for this one. Easy and painless – pictures are done! File these away in your computer. Do not forget to log the date in the title of the photos so you remember when it was taken. Next is your weight & measurements. You always want to do your weight and measurements on the same day as your photos. You will stay in your swim suit for this. On the next page you will find our progress chart. Print this out & keep it in a safe place as well as somewhere that you will not forget to update it each week. First write down the date & then hop on the scale & log your weight. Now we are going to take measurements. It is quite difficult to stay consistent with your measurement technique. Here are some tips to help you. Neck: Measure at the base or bottom of your neck. Chest: Measure straight across the largest part of your chest. 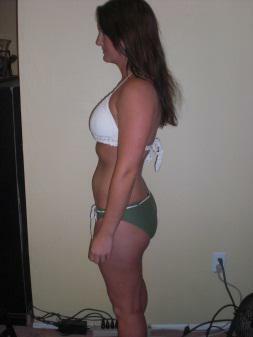 Waist – Stand up straight and bend to one side. Right when you see the separation from your upper half you’re your lower half is your waist line. Hips: Measure across the largest part of your bottom around the front of your pelvis. Thighs: Chose one side to measure. I think going with the right side is safest. Make sure to jot down on the paper that you are measuring the right side . This measurement is taken at the thickest part of the top of yout leg; close to your crotch. Bicep: Same thing here; chose one arm preferably your right just to remain consistent. Measure the largest part of your bicep. Finding a freckle or a distinct marking can help you remember this spot. Calf: Again choose one calf to measure. Measure at the largest part.